BOHO styled bridal shower theme that will work for any season. 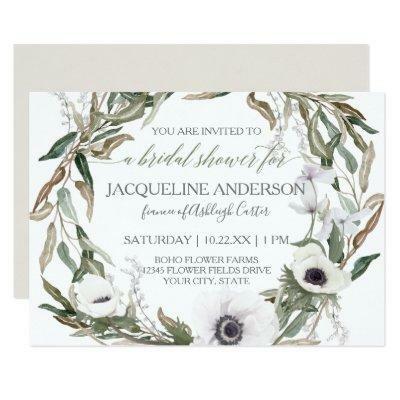 Featuring a hand painted watercolor floral and leaf swags in a loose modern style, with white anemones, baby&#;s breath, and olive leaf foliage. With a trendy, muted, ethereal color palette of soft white, charcoal, soft sage, brown and On the reverse side is a soft pattern of warm dove gray with a foliage leaf swag. Art copyright Audrey Jeanne Roberts, all rights reserved.